Does Less Stuff Mean More Happiness? Graham Hill says we need to declutter our lives. Part 4 of the TED Radio Hour episode Simply Happy. Can having less stuff, in less room, lead to more happiness? Writer Graham Hill makes the case for taking up less space. Graham Hill is the CEO of LifeEdited, which works with developers to market buildings that embody small space living. 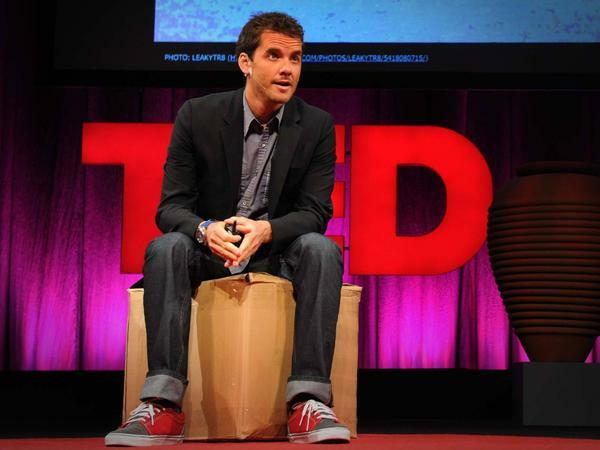 Hill is also the founder of TreeHugger.com, which aims to push sustainability into the mainstream with a design-forward style. OK, so if that sounds, you know, kind of simple, it's because there might be something to the relationship between simplicity and happiness. At least that's what the designer Graham Hill will argue. And back in the day, he was on the web before it was really the we web. GRANT HILL: Yeah, we were very fortunate. RAZ: We're talking '94, '95. HILL: This was at a time where people confused their email addresses and their website addresses. RAZ: OK, so the 10 second version of the story is Graham and some friends built a company designing websites. And then a couple of years later, they sold it for about $10 million. Graham was barely 30, never dreamed he would see that kind of money. HILL: No. I came from like, a middle-class sort of family and so yeah. RAZ: So you're 28. You've got all this money, and the natural thing to do is buy a lot of (beep). HILL: Yeah, it's like there's this void, all of a sudden, that you have to fill. And I didn't go that crazy, but it was just a lot of stuff. So I bought - yeah, I bought a 3,600 square foot home, Volvo sedan, tons of furniture, gizmos, technology, stereos, probably had one of the first MP3 players. You can't believe how much stuff. It was cool to have a nice car, but are you buying the right thing? Is it the right price? Yeah, and then so just thinking about it, I sort of feel like a pit in my stomach. Just having this house and just realizing you got to fill it full of stuff. I mean, listen, it's - I have zero complaints. I've been extremely fortunate, but, like, making a bunch of money doesn't radically transform you into a happy person. RAZ: Actually all that stuff started to drive him kind of nuts. So he decided to do something a lot of rich dudes don't, which is he got rid of it. And so Graham's big idea became too much stuff is making us less happy. Here he is on the TED stage. HILL: Did you know that we Americans have about three times the amount of space we did 50 years ago? Three times. So you'd think with all this extra space, we'd have plenty of room for all of our stuff, right? Nope. There's a new industry in town. A $22 billion, 2.2 billion square foot industry, that of personal storage. So we've got triple the space, but we've become such good shoppers that we need even more space. So where does this lead? Lots of credit card debt, huge environmental footprints, and perhaps not coincidentally, our happiness levels flatlined over the same 50 years. Well, I'm here to suggest there's a better way - that less might actually equal more. I bet most of us have experienced, at some point, the joys of less. College in your dorm, traveling in hotel room, camping where you got basically nothing, maybe a boat. Whatever it was for you, I bet that among other things, this gave you a little more freedom, a little more time. HILL: ...A nice couch. And so you're basically in a living room format at that point. HILL: ...You just pull out this wall that runs on tracks that are - it's like library technology - that are in the floor. RAZ: Kind of like bunkbeds. HILL: And so you get some decent privacy, and you can have guests over, which is great. RAZ: And that's really the least of it. Everything in Graham's tiny apartment - the kitchen, bathroom, everything is designed to save space and minimize stuff. HILL: The horizontal surfaces tend to attract stuff, and so the less you can have, the easier it is to be neat. RAZ: And instead, nearly every wall opens up to a storage space or a closet. There's a foldable table and chair seating for ten. And all that can be stored in the walls out of sight. I mean, this is a 420 square foot apartment. You have had dinner parties with 10 guests comfortably? HILL: Yeah. And it's a lot better than it sounds. Actually beautiful little room and our point is less but better. So, you know, we're not saying no stuff. Have stuff, just have great stuff that's really versatile and that you really love. RAZ: And right now, Graham is developing a whole apartment building based on this concept in Brazil. A community he thinks will be a really, really happy place to live. HILL: We want space efficiency. We want things that are designed for how they're used the vast majority of the time, not that rare event. Why have a six burner stove when you rarely use three? So we want things that nest. We want things that stack, and we want to digitize. You can take paperwork, books, movies and you can make it disappear. It's magic. Finally, we want multifunctional spaces and housewares. A sink's combined with a toilet. A dining table becomes a bed. Same space. So I'm not saying that we all need to live in 420 square feet, but consider the benefits of an edited life. Go from 3,000 to 2,000, from 1,500 to 1,000. So when you go home and you walk through your front door, take a second and ask yourselves, could I do with a little life editing? Would that give me a little more freedom, maybe a little more? So let's make room for the good stuff. Thank you. RAZ: So here's a story. My dad called me, and he said son, you are approaching middle-age. And I'm not - I don't feel like I should be storing your things from your childhood anymore. There are 14 boxes in the house, and I'm putting them on a crate in LA and shipping them off to you in Washington. So I got them, and there was such cool stuff in there like, art things I did when I was like, 6. And, like, it's kind of cool. And there's a lot of it. RAZ: There's an abundance of it. RAZ: But I can't, like - I kind of - it was special. It was, like, I don't - I got to get rid of this. HILL: So I would say, like, how important is the physical aspect of that? And so, like, I'll have a - like, a shirt that I've worn. It's got - there really - there are memories attached to it. I just take a picture. Done. RAZ: Yeah, OK. But I get that. That's fine, but I'm not going to take a picture of, like, my handprint in the clay from when I was, like, three. RAZ: Because it's cool. I mean, my kid can hold that. This stuff makes me happy. HILL: I'd probably - and if it was me, I'd probably keep maybe a handful of them, and then take pictures of all the rest. RAZ: But how do you know you're not going to regret that one day? Like, how do you know you don't sort of like, over edit your life? HILL: Yeah, well, you - but think about it. You didn't even know what that stuff was necessarily. RAZ: Right. That's a good point. HILL: So, I mean, I think as a way of editing your own life, let's just remember that what really matters in life is memorable experiences, connections and relationships. And space and stuff should support that. RAZ: Graham Hill. His company is called Life Edited. You can see really amazing pictures of his apartment at LifeEdited.com. And check out his talk at TED.NPR.org. Transcript provided by NPR, Copyright NPR.